In the Orthodox Church, there are a lot of customs and traditions that are important parts of our worship. Some are cultural; some are pious customs. Some are essential; some are not. From time-to-time, we need to address some of these various etiquette issues to inform our communities how we can best understand each other and work together to worship the all-holy Trinity. Remember the time when people put on their “Sunday best” to go to church? In fact, dress clothes were often referred to as Sunday clothes. In some parts of the country, this is not common today. In fact, all too often, dress in church has become too casual. In all areas of our lives, we should offer Christ our best. And the same is true of our dress. We should offer Christ our ‘Sunday best”, not our everyday or common wear. And we should dress modestly, not in a flashy way that would bring attention to ourselves. Our dress should always be becoming of a Christian – especially at church. Only young children (under 10) should wear shorts to church – and then only dress shorts. Athletic shorts, cut-offs, and spandex shorts are never appropriate church wear (for children or adults!). Shoes or sandals should be clean and tied. No one should wear T-shirts with any kind of writing on them (“This Bud’s for You!” is definitely out). Dresses should be modest. No tank tops or dresses with only straps at the shoulders, no short skirts (mini-skirts), and no skin-tight dresses. Dresses should have backs and not be cut low in the front. If women wear pants to church, they should be dress pants (not jeans, leggings, etc.). Shorts of any type are not appropriate for church. Men should also dress modestly. While coat and tie are not mandatory, shirts should have collars and be buttoned to the collar (the actual collar button may be left undone, but two or three buttons undone is inappropriate). Slacks should be cleaned and pressed. Jeans (of any color) are usually too casual for church, especially ones with patches or holes. Again, shorts are not appropriate church wear. If you’re going somewhere after church where you need to dress casually, bring a change of clothing with you and change after coffee hour. Remember, use your best judgment and good taste when dressing for church. After all, you don’t go to be seen by everyone else – you go to meet and worship God. Have you ever looked at an icon in just the right light and seen the lip prints all over it? It’s disgusting, isn’t it? In fact, it’s downright gross. Lipstick may look fine on lips, but it looks horrible on icons, crosses, the Communion spoon and the priest’s or bishop’s hand. Icons have been ruined by lipstick; and even though the cross can usually be cleaned after everyone venerates it, it just isn’t considerate to others to impose your lipstick on them. What is the answer? If you insist on wearing lipstick to church, blot your lips well before venerating an icon, taking Communion, or kissing the cross or the priest’s or bishop’s hand. Even better, wait until after church to put it on. After all, God is not impressed with how attractive you look externally – your makeup or clothing – but how attractive you are internally, your adornment with good works and piety. When you enter the church, it is traditional to venerate the icons. Usually there are icons at the entrance to the church and many churches have icon stands in the front as well. When venerating (kissing) and icon, pay attention to where you kiss. It is not proper to kiss an icon in the face. You wouldn’t go up and kiss the Lord or His mother on the lips, would you? You would kiss their hand, and only of they invited you would you even dare to kiss them on the cheek. Pay attention to what you are doing. When you approach and icon to venerate it, kiss the gospel, scroll, or hand cross in the hand of the person in the icon, or kiss the hand or foot of the person depicted. As you venerate and icon, show proper respect to the person depicted in the icon – the same respect you would show the person by venerating him or her in an appropriate place. And remember, blot off your lipstick before kissing. Did you know that the proper way to greet a priest or bishop is to ask his blessing and kiss his right hand? How do you do this? Approach the priest or bishop with your right hand over your left hand and say “Father (or “Master” in the case of the bishop), bless.” This is much more appropriate (and traditional) than shaking their hands. After all, the priest and bishop are not just “one of the boys.” When you kiss their hands, you show respect for their office – they are the ones who “bless and sanctify” you and who offer the holy gifts on your behalf. So next time you greet your priest or bishop, don’t shake his hand, ask for his blessing. After taking Holy Communion and at the end of the liturgy, it is traditional to eat a piece of holy bread or antidoron – the bread that was left over after Holy Communion was prepared. While antidoron is not Holy Communion, it is blessed bread and as such, should be eaten carefully so that crumbs don’t fall all over the place. After taking Communion or kissing the cross at the end of the Divine Liturgy, take the antidoron in both hands and when you return to your seat or get to a place where you can stop for a moment, eat the bread trying not to drop crumbs. If you want to give a piece to someone else, go ahead and take an extra piece – don’t break yours in half (it produces too many crumbs). And monitor your children as they take the antidoron and teach them to eat it respectfully. The traditional posture for prayer and worship in the Orthodox Church has been to stand. In the Orthodox “old countries”, there are usually no pews in the churches. Chairs or benches on the side walls are usually reserved for the elderly and infirm. In North America, we have tended to build our churches with pews, and since we have them, we need to figure out when we may sit and when we should stand. First of all, it is fully acceptable (even preferable) to stand for the entire service. If you prefer this, it would be better to find a place closer to the back or side of the church so as not to stand out or block someone’s view. When should you definitely stand? Always during the Gospel reading, the Little and Great Entrances, the Anaphora, the distribution of Holy Communion, whenever the priest gives a blessing, and the Dismissal. In many parishes, the Divine Liturgy books in the pew have suggested times when sitting is acceptable. Follow those instructions (it’s probably safer than to follow what the people are doing in the first couple of rows). When in doubt, stand. It is never wrong to stand in church. Lighting candles is an important part of Orthodox worship. We light them as we pray, making an offering to accompany our prayers. Orthodox typically light candles when coming into the church – and that is usually the best time to light them, but there are times when candles should not be lit. It is not proper to light candles during the Epistle or Gospel readings, during the Little or Great Entrances, the sermon, and most of the times when the faithful are standing. If you find yourself arriving to church after the Liturgy has begun, a good rule of thumb to remember is – if everyone is standing, wait until they are sitting to light a candle (unless they are sitting for the sermon, of course). Other than that it is probably all right to light a candle. In some Orthodox cultures, crossing one’s legs is taboo and considered to be very disrespectful. In our North American culture, while there are no real taboos concerning crossing one’s legs, we tend to cross our legs to get comfortable while sitting. Should we cross our legs in church? No. Not because it is “wrong” to ever cross legs, but rather because it is too casual – and too relaxed – for being in church. Just think about it, when you get settled in your favorite chair at home, you lean back, cross your legs, and then your mind can wander anywhere it wants to. Remember that sitting in church is a concession, not the normative way of prayer. You surely don’t want to get too relaxed and let your mind wander off too much. In fact, when you do sit in church, you should sit attentively – and not too comfortably. When sitting in church, keep those feet on the floor, ready to stand at attention (which is what “Let us attend” means). Cross yourself with your fingers and hand – but don’t cross your legs! In and out? It’s a hamburger place in LA, but shouldn’t be the traffic pattern by the back door during services. On some Sundays, it almost seems like we have a revolving door in the back of the church – and it is used by both children and adults. Use the restroom before coming to church. You shouldn’t need to get a drink of water during the service (especially if you are taking Communion!). Don’t come to church to go to the fellowship hall – come to pray. Leaving church before the Dismissal – besides being rude – deprives us of a blessing. Worship has a beginning (“Blessed is the Kingdom…”) and an end (“Let us depart in peace…”). To leave immediately after Communion is to treat church like a fast food restaurant where we come and go as we please. We live in a fast-paced world where we seem to be hurrying from place to place. But in God’s presence, we need to make every attempt to fight this pressure to move on to the next thing on the day’s agenda. We deprive ourselves of blessings by not being still and participating in God’s holiness. Eat and run at McDonald’s – but stay in church and thank God for his precious gifts. 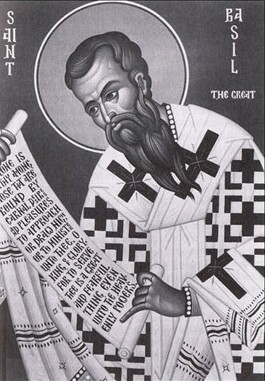 When you hear one of the variations of the phrase, “Father, Son, and Holy Spirit”; at the beginning and end of the liturgical service or your private prayers; entering or exiting the church, or when passing in front of the Holy Altar; before venerating in icon, the cross, or Gospel book. At the chalice before or after taking Communion (you might hit the chalice with your hand); when the priest or bishop blesses saying, “Peace be to all” – bow slightly and receive the blessing; when receiving a blessing from a bishop or a priest (kissing the right hand of the bishop or priest is appropriate, but not making the sign of the cross). Many people like to touch the hem of Father’s phelonion as he goes through the congregation for the Great Entrance. This is a nice, pious custom by which you “attach” your personal prayers to the prayer of the entrance with the holy gifts. At the same time, you need to be careful neither to grab too hard and trip up the Great Entrance, nor to push people out of the way. And be sure to help your children so that they observe these guidelines as well. You can always tell where young children have been sitting in the church. The tell-tale signs are graham cracker crumbs, Cheerios, and animal crackers. Parents often bring snacks and a cup of fruit juice along for children during church. And for young children (0-2 years old), this is fine. 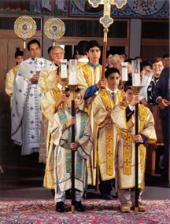 But by the time children are 3-4 years old, they should be able to make it through Liturgy without eating anything, and by the time they reach seven (the age of their first confession), they should begin fasting on Sunday morning for Communion (or at least make an attempt at fasting by cutting back on the amount of breakfast and eating “fasting”-type foods – talk to your priest about this). For those children who get snacks, please don’t feed them while in the line for Holy Communion (this applies to holy bread as well). They need to come to Communion without food in their mouths. And one last note: try to keep the snack mess down to a minimum. The floor shouldn’t be covered with Cheerios! Chewing gum during Liturgy is a No-No for everyone! North American society in the late 20th century is rather casual in its approach to life. Don’t allow this prevailing attitude to enter into your Orthodox Christian piety. There are surely a lot of other areas that could be covered here. Much of church etiquette is based on common sense and showing respect for God and others. Always remember that you are in church to worship God, the Holy Trinity. The priest says, “With the fear of God and faith and love, draw near.” Let this be the way you approach all of worship. If you do, you will probably have good church etiquette. Fr. David Barr is priest at St. Elias Antiochian Orthodox Church in Austin, Texas. This article, which first appeared in The Word, January 1997, pp. 4-7, is used by permission.